Widely known in the West as ‘T’ai Chi C’huan WG’ from the Wade Giles form of the full name tàijíquán 太极拳, taiji is a hugely popular form of exercise and martial art. It can be roughly translated as ‘Supreme ultimate boxing’. 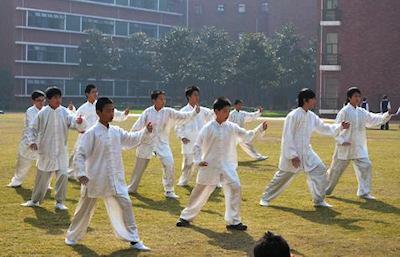 Tai Chi at a Shanghai Middle School. Image by Yhz1221 ➚ available under a Creative Commons license ➚. Tai chi is a quintessentially Chinese phenomenon that is one of the first things that spring to mind when thinking of China. Chinese martial arts are well known worldwide through TV series like the popular and iconic 'Kung Fu ➚' series and numerous martial arts films made in Hong Kong and China. There are many schools with their own particular techniques, and competition between them has always been fierce with great secrecy surrounding a school's particular specialism. The reason for the development of the martial arts in monasteries was that active exercise was seen as a necessary and healthy contrast to long periods of static, quiet meditation. Taijiquan is used as a relatively gentle exercise and meditation practiced by millions in China. It maintains muscle tone and posture as well as breath control. Just as important as the graceful movements is the holding of the body in relaxed posture between steps. It is sometimes called ‘shadow boxing’ with origins linked to Daoism over a thousand years ago where self defense is the principal objective rather than attack. Wang Zongye ➚ developed the taijiquan style in the middle of the Qing dynasty at Chenjiagou in Henan. There are four main schools Yang; Wu; Sun and Chen - each named after the people who devised them. Yang movements are graceful and relaxed with circular motion, Wu has close-knit and gentle movements; Sun has delicate and exquisite movements while in Chen the movements are more abrupt. Yang is the most popular school and has been described as ‘reeling silk thread off a cocoon’. Graceful Chinese opera and ballet movements often take tai chi moves as their inspiration. Wudang Shan ➚ in Hubei is one of the leading monasteries that teaches Taijiquan. The Taiji figure shows yin and yang circling and embracing each other. 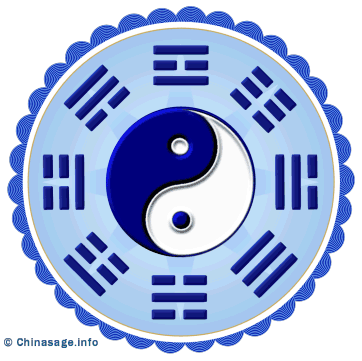 It is often used as the symbol of Taijiquan schools. It originates from Daoism where it signifies the balancing yin and yang opposites: strong and soft; outward and inward; fast and slow, as well as the cultivation of a healthy flow of qi (life force). The body's movements stem from just below the navel and movements should be slow and flowing. Developing a calm but powerful center is both an exercise and a meditation. Control of the flow of qi allows practitioners to perform the many amazing feats of balance and force: such as breaking bricks with bare hands. The practice consists of a precise set of between 12 and 108 moves one after the other and these can take up to an hour to complete. Nature inspires many of the movements; animals such as: cranes, tigers, monkeys and snakes. The various sequences are given poetic names such as: The white crane spreads its feathers; Parting the mane of a wild horse; Wild goose drinks the water; Two butterflies dancing together and Catching the bird by its tail. Most taichi actions are performed alone but the tuishou ➚ (push hands) technique has pairs of people pushing their hands to balance and exert pressure on each other. Covers etiquette, traditions and a fair bit more: film stars, history summary. A very useful guide to anyone moving to China and wanting a quick introduction to the culture. Written by Chinese authors so this is authentic information. Relax. It is important to remove all stress before starting the exercises. Concentrate entirely on the exercise and think of nothing else. Hold the head in an upright posture not slouched forward. The base of the spine is the fulcrum of the exercise, it should be kept straight and upright. The waist and hips should be relaxed, they should move gracefully with the rest of the body. Breath control is important. Breathe slowly; deeply and evenly through the nose. Think about each movement, making it as smooth and fluid as possible, in the form of a closed loop. Over many years, but less so now among the young, people practice T'ai chi in their early morning exercise in city parks. Everyone follows the intricate moves in step. Long term practice gives health benefits, maintaining fitness, posture and suppleness into old age. Wushu 武术 is the more general term used in China for martial arts, it can be translated as the ‘art of fighting’. It has from earliest days (3,000 years ago) been practiced by both men and women. Wushu is mainly associated with Buddhism. Changquan ➚ ’long boxing’ is popular amongst young people. Nanquan ➚ ‘southern boxing’ is a term for the various techniques in southern China, often with small jumps and arm swinging. Taijiquan can be thought of as part of this wider form. You can see the northern forms in the film ‘Hero ➚’ while the southern forms were used in ‘Crouching Tiger, Hidden Dragon ➚’. Different from Taiji and not really a martial art is the discipline of Qigong ➚; in this school it is the control of breathing and the holding of posture that is important. Qigong is considered a wushi technique and dates back before taiji into old Daoist methods of meditation and breath control. The careful control of the flow of qi maintains health and guarantees a long life. The term 'Kung fu' as it is widely known in the West, covers a wide range of different techniques. The neijia ➚ (internal) schools concentrate on inner strength, passive resistance, while waijia ➚ (external) schools emphasize active, physical force. Spears, swords and poles are used in some techniques, among 18 weapons, for example Taijijian ➚ is exercised with an ornate sword. All the Japanese martial art forms of karate ➚; judo ➚ ('soft path'); taekwondo ➚ are believed to have their origins in the martial arts of Ming dynasty China. Gong fu (Kung fu WG) can be translated as ‘fighting competition’ which describes the many competitive fights between the contending schools of martial art. Bagau Zhang ➚ school is a ‘neijia’ art with many circular movements. Xingyi Quan ➚ school by contrast is a ‘waijia’ art with powerful strikes and blows. The Shaolin monastery ➚, Henan is world famous for the teaching of the Shaolin Quan martial art, it represents a more aggressive form of the same techniques. An international championship is held near Shaolin, Henan each year. Shaolin Quan dates back 1,500 years from roots in Buddhism brought from India. Citation information for this page : Chinasage, 'Tai Chi, Kung fu and other Chinese Martial Arts', last updated 28 Nov 2016, Web, http://www.chinasage.info/taijiquan.htm.